The German–Spanish Treaty of 1899, (Spanish: Tratado germano-español de 1899; German: Deutsch-Spanischer Vertrag 1899) signed by the German Empire and the Kingdom of Spain, involved Spain selling the vast majority of its remaining Pacific Ocean islands to Germany for 25 million pesetas (equivalent to 17 million Marks). ✪ A Farewell to Arms - Ernest Hemingway I WHO DID WHAT IN WW1? During the 19th century, the Spanish Empire lost most of its colonies to independence movements. Then came the Spanish–American War in 1898, in which Spain lost most of its remaining colonies. Cuba became independent while the United States took possession of Puerto Rico along with the Philippines and Guam from the Spanish East Indies (Spain's Pacific Ocean colonies). This left Spain with only it's African possessions and with about 6,000 tiny, sparsely populated, and not very productive Pacific islands. These latter were both ungovernable, after the loss of the administrative center of Manila, and indefensible, after the destruction of two Spanish fleets in the Spanish–American War. The Spanish government, therefore, decided to sell the remaining islands. Germany lobbied the Spanish government to facilitate the sale of the islands to Germany. The Spanish Prime Minister Francisco Silvela signed the treaty on February 12, 1899. 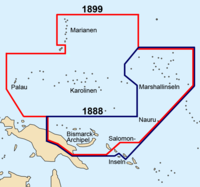 It transferred the Caroline Islands and the Northern Mariana Islands to Germany, which then placed them under the jurisdiction of German New Guinea. Palau, at the time considered part of the Carolines, was also occupied and during the following years the Germans started up mining there. In October 1914, during World War I, Japan invaded and conquered many of these German possessions. After the war, they became in 1919 the South Pacific Mandate of the League of Nations, under the control of the Japanese Empire. During and after World War II the United States took control of the former Spanish and German archipelagos in the Pacific. ^ "Palau profile - timeline". BBC. 3 March 2015. Retrieved 9 November 2015.